On Monday 21st December, the Indonesian Defence and Foreign Ministers met with the Australian Defence and Foreign Ministers in Sydney and warned Australia and other countries to “respect its sovereignty over West Papua”. 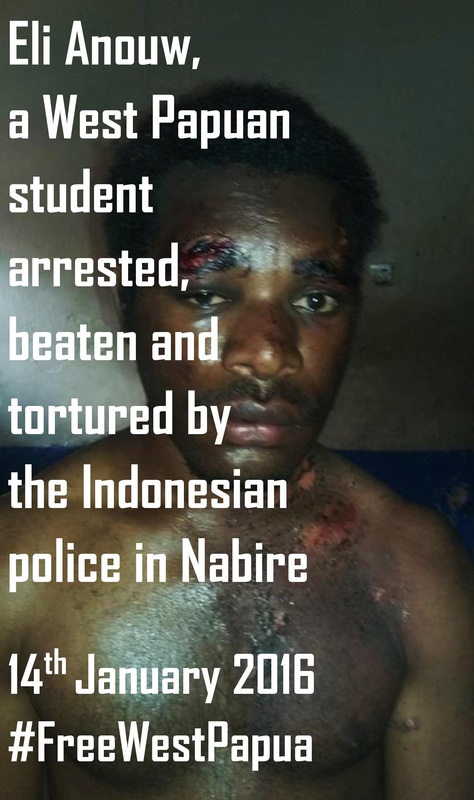 Not only that but also they boasted about strengthening military ties with Australia, on the very same day that 22 year old West Papuan Marvel Doga was shot dead by the Indonesian military for protesting against a palm oil company. Such state killings and brutality are always the only ‘Christmas presents’ we West Papuans get from the Indonesian government. What is there to be proud of for killing youths that challenge the corporations destroying their land? West Papua has never been and will never be part of Indonesia. Indonesia is the problem. Independence for West Papua is the solution. The Indonesian Defence Minister is an inherent part of this problem because he is responsible for the more than 40,000 Indonesian soldiers illegally occupying West Papua. He has no right to talk about West Papua and can talk about Indonesia from Sabang to the Moluccas because that is where Indonesia’s real borders belong but West Papua is a Melanesian nation that has nothing to do with Indonesia. 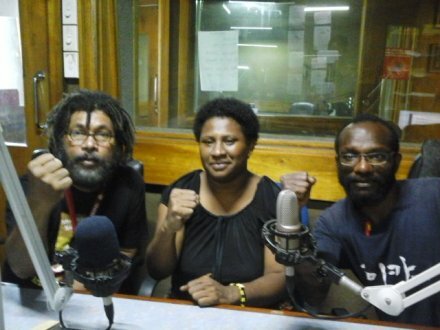 Most commentators would agree that the reunification of Melanesian people is something to be praised and in fact the Melanesian nation of Vanuatu has been praised for encouraging Melanesian unification as part of supporting West Papua’s freedom. 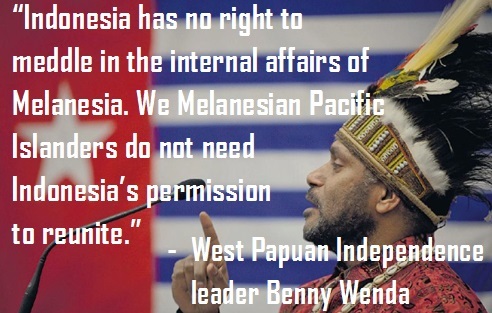 Indonesia has no right to meddle in the internal affairs of Melanesia. 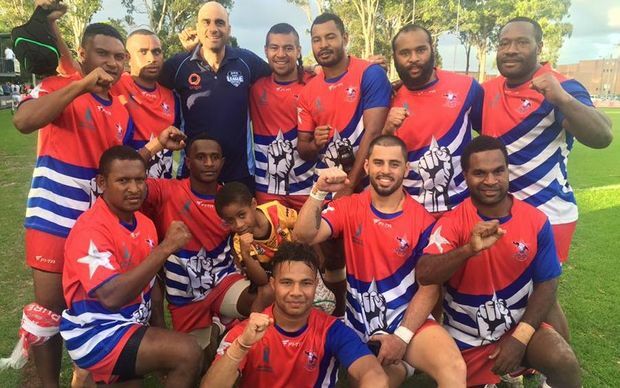 We Melanesian Pacific Islanders do not need Indonesia’s permission to reunite. Melanesian and Pan-Pacific unity flows in every river, whispers up every tree and floats upon every wave of the Pacific Ocean. It surges through our very souls as Melanesian people. We continue to yearn and continue to strive to reunite with wantoks; with all our brothers and sisters so that one day we will be one free family again. Through peaceful struggle, we West Papuans are ready to set ourselves free from the oppression of Indonesian rule. Indonesia’s colonialism will come to an end very soon. This Defence Minister once infamously said that the killers of West Papuan Independence Leader Theys Eluay were “heroes”. Who are the real criminals in West Papua when military generals like Ryacudu continue to approve of such killings and continue to orchestrate this ongoing genocide which has left over 500,000 West Papuan people dead? 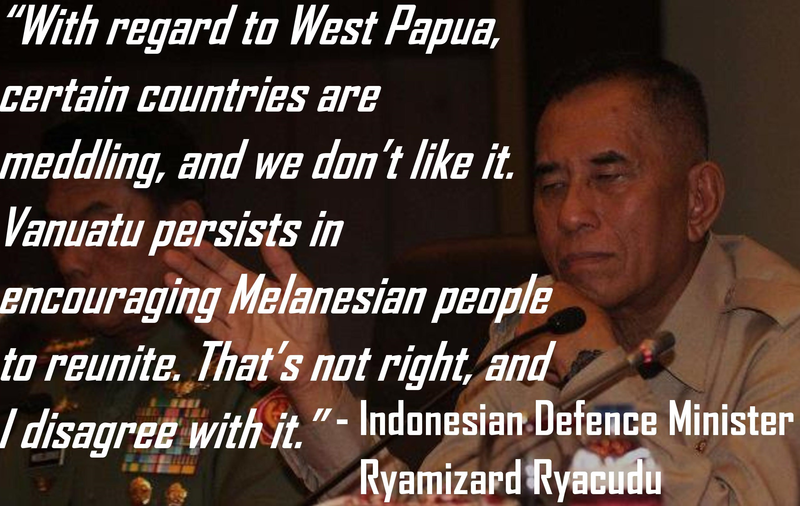 Not only did Ryimizard Rycaudu warn Australia, Vanuatu and other countries over West Papua, he went onto say that Indonesia had “never disrupted or caused disruptions in other countries” and it expected the same of other nations regarding Papua and its long-running independence movement. As a West Papuan, a Melanesian and a Pacific Islander I am outraged that such malicious threats and outright lies continue to be blurted out by Indonesian government ministers about the lives of my people and countries that support us. Indonesia invaded West Papua, invaded East Timor and earlier this year executed Australians Andrew Chan and Myuran Sukumuran. They even threatened to go to war with Vanuatu because of its support for West Papua’s freedom. We West Papuans (living just 250km North of Australia) have been suffering under a secret genocide and the illegal occupation of our country since West Papua was illegally annexed by Indonesia in the 1969 so called Act of Free Choice; (known to West Papuans as the Act of NO Choice.) During the resulting long decades of torture, it is estimated that over 500,000 people (in 3 West Papuans) has died because of this military occupation. Earlier this month, the Human Rights Commission Komnas HAM has found that human rights violations have increased in West Papua this year, documenting over 700 West Papuans who were persecuted by the Indonesian State in 2015. Only last week on 19th December, 23 West Papuans were arrested and locked up just for peacefully demonstrating against the illegal Indonesian occupation. The Indonesian government is doing all they can to try to stop the truth from coming out of occupied West Papua and Human Rights Watch recently released a 74 Page report detailing how foreign journalists are still being effectively barred from working there. On top of this, a few weeks ago the Indonesian President even ordered all International NGO’s to leave West Papua by the end of 2015, a move obviously proving that the Indonesian government has something to hide. The Indonesian President Joko Widodo is also planning to visit West Papua before the end of 2015 but he is certainly not welcome. We West Papuans know that such visits are merely publicity stunts attempting to show government care about West Papua whereas actually the Indonesian President is visiting West Papua to further impose Indonesian state control over West Papua. This means more Indonesian soldiers and more deals with multinational corporations like Freeport McMoran that exploit and destroy our ancestral land. We firmly believe that his visit will only bring more trouble in 2016, more bloodshed of West Papuans. West Papuans are Australia’s closest neighbours and we West Papuans look to Australia as our big brother in the region. Therefore on behalf of my people I appeal to the Australian government not to forge more military ties with this human rights abusing government. Why deal with a government that is committing genocide against your closest neighbours? It has been revealed that Australian supplied military helicopters have previously been used to bomb West Papuan villages and so any new military ties between Indonesia and Australia send shivers down our spines. These new military ties terrify West Papuan villagers who do not know if they will be the next victims of this brutal genocide. The Indonesian government has already failed to convince the world of all their moral, political and legal arguments over their continued occupation of West Papua and the only channel they have left is their so called ‘economic diplomacy’. The world needs to be aware that this is the only tactic the Indonesian government can use now. Therefore I urge the Australian government and parliament to please look to the suffering of your closest neighbours in West Papua, and help to promote human lives over money from Indonesian “economic diplomacy”. We desperately need the support of our big brother Australia to please help us against this secret genocide and the ongoing military occupation of our ancestral lands. Please do continue to support my people, to write to your representatives and tell as many people as possible about West Papua. 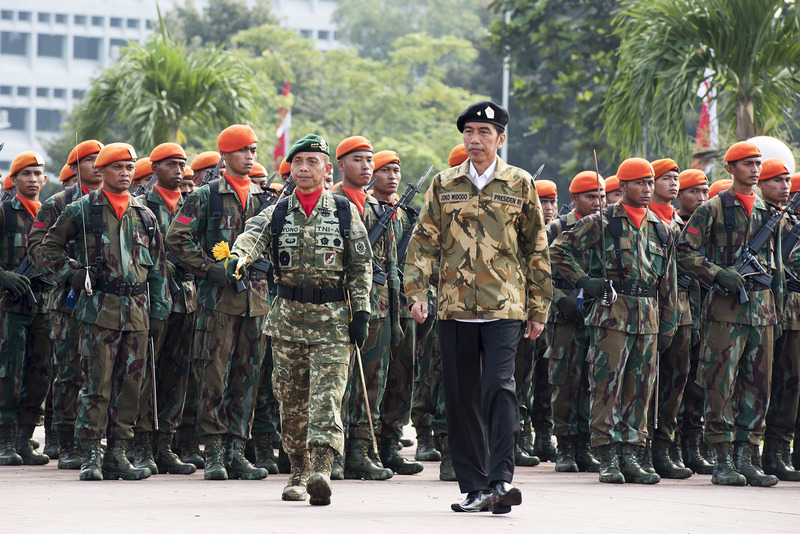 Neither the threats of the Indonesian government nor the bullets of the Indonesian military will break the spirit of my people and our resolve to struggle for full freedom through self-determination. We are certain that one day we will finally be free.